Proclaims the Shruti (Taittireeya) - सत्यं वद! धर्मञ्चर ! 'Impossibly difficult', exclaims the Jiva in this yuga! Untruth, for the Jiva, is simply the way of life. Dharma is so 'inconvenient' today, and possibly approaching a time where it may be relegated to being irrelevant! What does the human value today? Has the four-fold purushartha just got abridged to Artha-kama alone? Untruthfulness, and insincerity, its corollary, have become as fluid as one's breath! So much so, that one oft wonders how one could even live without untruth!! The 'understanding' of irreparable material loss upon abiding by truth and dharma is very 'clear' to everyone. Exceedingly rare is the recognition of the loss resulting from non-conformity to them - for, it is a much subtler issue! We spin an 'Avarana' of untruth around us - a gap between the 'real me' and the 'projected me'. Though greater the gap, greater my woes and stress, I understand it not, and assiduously hold up a facade that I want others to know me as! Falsehood within falsehood! Mahamaya has the last laugh! Even when one sees oneself sinking day by day, there is no resolve, no serious attempt to extricate oneself, "उद्धरेदात्मनात्मानम् ... "
"This, above all, to thine own self be true, and it must follow, as the night the day", said the Bard, "thou canst not then be false to any man!" Even in the only act where the will is supposedly free, i.e. prayer, where one is not answerable or accountable to anyone but oneself, one is unable to manage to be true! Such is the force of long habit, immersion, or 'esnarement' of maya - the saga of helplessness. 'Lord answers sincere prayers', but hey, are prayers not meant to be sincere in the first place, that Bhagavan may exclaim, "You are not serious, are you?" There are melodious hymns and structured prayers of exquisite depth and beauty, but does it reflect in my heart as well? Jiva's predicament is well understood by the compassionate Guru Maharaj, and He does not judge us. He even sends his chosen Apostle to articulate our helplessness and plight - Swamiji speaks for us in the famed stotra thus - "O Bhagavan, वक्त्रोद्धृतोsपि हृदये न विभाति किञ्चित् , do you not know that even though beautiful words of prayer escape my lips, they do not echo in my heart? That is how I am, a Jiva!" O compassionate Lord, who knows this weak Jiva's limitations, and considers even the attempt as acceptable, even as a doting Mother accepts the ignorant infant's prattle as a praise - I am encouraged, to take a tottering step towards you... may be, one day, I shall succeed in dissolving my self-created avarana, and just be myself, a child of Ishvara!! Verily thus, Thou art my sole support तस्मात् त्वं एव शरणं मम , O friend of the helpless हे दीन-बन्धो ! I'm protected online with Avast Free Antivirus. Get it here — it's free forever. Vivekananda, from whom emanated the words of fire... exemplified the prayer of the Vedic Rsis, in our times, "अग्निर्मे वाचि श्रितः","may fire be enshrined in my speech! We know well how he wished that the youth of the nation may hold Mahaveera Sri Hanuman as their ideal, ideal in every possible way! 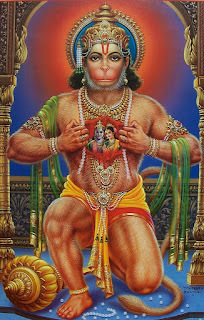 In his own life, we get a clear image of the personality of Sri Hanuman! "Aye, I am ever the servant of Sri Ramakrishna.." or, "out of dust he could produce a thousand Vivekanandas..", or "G.C., ask me to pulverise the mountains, or dry up the oceans... but how can I speak about Sri Ramakrishna.." (meaning, I am too small to describe my Master) - describe his attitude as Ramakrishna-dasa, like Sri Hanuman exemplifies dasya-bhakti in this world as Ramadasa). Such self-effacing giants, who served their Masters with devotion exemplary, had so much in common. ...and Mother Sita who blessed Sri Hanuman, blessed Vivekananda as Mother Sarada! 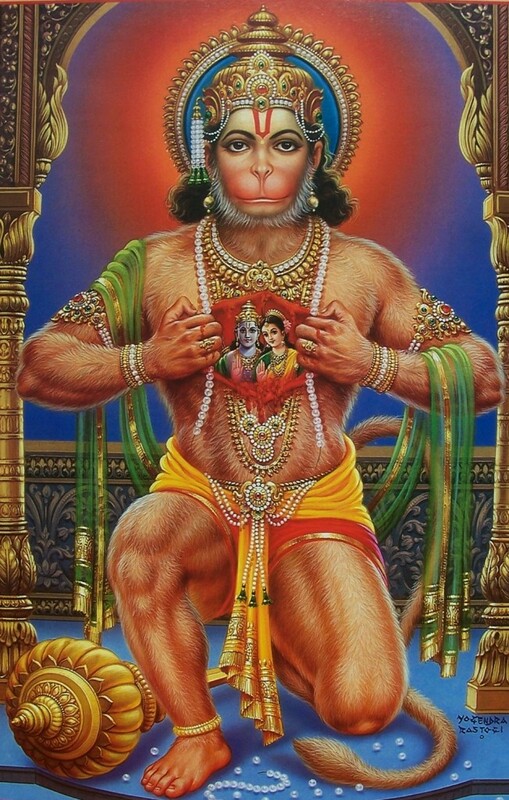 Despite stupendous accomplishments, where was Hanuman in his own reckoning, other than as Rama-dasa? Swamiji says, "our best work is done, our greatest influence is exerted when we are without thought of self" or "the world is in need of those whose life is one burning love, selfless. That love will make every word tell like a thunder bolt!" Yes, for its own good, the world must know him (them) as " अतुलित-बलधामं and ज्ञानिनां अग्रगण्यं and सकल-गुण-निधानम् " , as also pray to him (them) for निर्भयत्वं and वाक्-पटुत्वम् !! A look at the figures of both these Mahaveeras would convince anyone of 'Strength' assuming a form! Look at the immortal words that emanate thence, "make your nerves strong. What we want is muscles of iron and nerves of steel....stand on your feet and be men!" "If there is one word that you find coming like a bomb from the Upanishads, bursting like a bomb-shell upon masses of ignorance, it is the word, 'अभीः' fearlessness." "This is a great fact: strength is life; weakness is death. Strength is felicity, life eternal, immortal; weakness is constant strain and misery, weakness is death." " To succeed, you must have tremendous perseverance, tremendous will. "I will drink the ocean", says the persevering soul; " at my will mountains will crumble up." Have that sort of energy, that sort of will; work hard, and you will reach the goal." In as many words, is Swamiji describing Sri Hanuman for us to emulate, to hold as the ideal - for a nation that needs just this elixir of life? extraordinary strength, wisdom, perseverance. 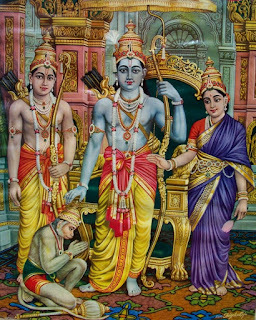 The National ideal has to be Mahaveera Hanuman from Ramayana of yore, or Mahaveera Vivekananda from Ramakrishnayana of now, for they are non-different, the two names for the same phenomenon!! Before we have dealt with the vagaries and pending struggles of the year 'just past', the 'new one' is here, 2018, opening with Kalpataru day!! The accounts not yet settled, the mind still unsettled, the Jiva enters another set of 365 days Samsara, (thankfully one Samvatsara (year) at a time!). "Kalpa-taru", we are told He is. 1886 began with that phenomenal day, just months before He wound up His Leela. The incident, or rather event, is worth reading again each year. On a warm sunny day time of a cold winter, some Jivas, symbolizing minds as it were, were sitting or strolling in the garden-house (Udyan Bati). It was a pleasant hour, and the senses rejoiced at the sights and sounds, and the freshness in the air. They were there, primarily just to be around in the vicinity of Sri Ramakrishna (who was unwell), and because it was a holiday, and so there were no other commitments - some relative freedom - if we may say so. Unexpectedly, and to the pleasant surprise of those few gathered Bhaktas, Sri Ramakrishna arrived, walking towards them in the garden path, and they were overjoyed to behold Him right ahead. They greeted him, and approached joyously. It is then that he suddenly posed the question to Girish Babu, as to what he understood of Him. Kneeling in surrender, and overcome with emotion, pat came Girish's clear and spirited reply, "How can my little self describe Him, in extolling the greatness of whom Valmiki and Vyasa fall short of words ...."
Charmed at those words of devotion, Bhagavan Sri Ramakrishna, in a powerful gush of compassion, blessed them all like never before, with those celestial words, "What more can I say to you, may you all be awakened!" ....and He went into ecstacy. The profound blessing sent them into amazingly blissful state, an exalted mood, wherein, forgetful of all else, they prostrated at His feet in surrender, worshiping Him in various ways.... He had granted them without any reservation, their spiritual desires; it was in sheer abandon, all conditions thrown overboard!! All those Jivas, the minds so to say, had one thing in common - He was the center of their being, their seeking! As against the deluge of all other desires, they sought the one, obtaining whom every other seeking ends...and it is in this very Kaliyuga!! What is even more reassuring is the fact that it is Thakurji Himself who walked towards them, to grant them refuge! When the mind is intent upon the Lord, as against a billion 'desirables' in the world, His Krpa can not be held back..... it flows. A Kalpataru may grant all kinds of desires, but here is the Moksha Taru that awakens any Jiva (mind) that lovingly seeks Him. They loved the Lord and the Lord loved them. What minds... what a day...and what a revelation!! Kashi is 'Moksha Puri', and no wonder it was Kashi-pur where abahayam was granted!! Let us too, keep our minds relatively free of entanglements, and be 'available' to love Ishvara! The Mother is the Mother, is the Mother, as none else! The Father may shun the errant child perhaps, in some frustration, looking to the 'seeming incorrigibility'.....but how can the Mother who is the Mother!! I might have chased the glitter of the world for all the best part of my life, and now, worn out, forlorn, and burnt by the very world, think of my Mother - so late for anything tangible for inner growth! Yet it is She - the most compassionate one - The Mother, who still wishes to trust me in devotion to herself! Ah! It is the Mother, after all, to repose such faith even in the most worthless of her children ... because She is the Mother!! 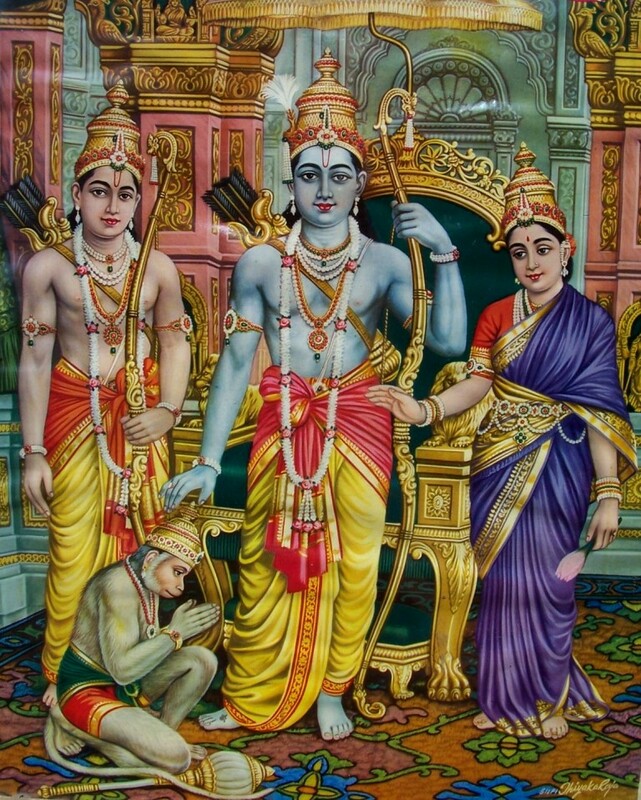 She is Mahaamaayaa, and chooses out of compassion for the hapless child, to withdraw Maya's deluding power unto Herself, just a bit - enough to pull me out of the morass, to take me across Samsara - out of sheer compassion (... and not qualification); all just because this child did at last call out for her! May that Sarada, the Dispenser of Jnana (Self-knowledge), joyously abide in my heart for ever and ever! O Mother, ever-committed to saving those in distress, save me from this Samsara! * निःसार-संसार-दासः slave of the 'worthless' world. ** स्वदासं सारदा can be read as 'स्वदा संसारदा ' Samsarada संसारदा - one who grants the vagaries of the world and its entanglements, if that is what one seeks, or Svada स्वदा - one who grants Herself, the only abiding truth, the cause of everything, सारदा , because she is Janana-daatri - giver of knowledge ज्ञान-दात्री ! Yet another Guru Poornima to remind the Jiva, to wake us up from slumber, the over-powering tamas.... A reminder to seek the grace of Ishvara, to awaken to the only goal everyone really has, to be able to surrender at the feet of the Guru, to be able to pursue Brahmavidya unhindered.... commit to Sravana-Manana-Nididhyasana! .... all this, as precious time flows by, as the body ages, as the senses wear out and one is slowly, then acutely aware of the advent of the evening of life! Mahamaya has her total sway, powerful sway. वृद्धस्तावत् चिन्ता-सक्तः, परमे ब्रह्मणि कोsपि न सक्तःll', says Shankara, exhorting the Jiva to seek Ishvara - Bhaja Govindam, Bhaja Govindam....', he shouts, trying to awaken us, our clouded minds (मूढ-मते). The Sadguru, exemplified by Adishankara, overcome with compassion, relentlessly prods the Shishya; for, who can love us more than the Guru? 'Uttama Vaidya', Sri Ramakrishna calls him rightly - He doesn't give up! But for these compassionate ones, where would we be? With our dull initiatives and feeble moves, where indeed?? Prayer, and more prayer... to endow us with that unwavering commitment to freedom! !